One of the most common images around Halloween is that of an old witch huddled over a boiling cauldron creating a potion. Likewise, sorcerers, are depicted as having special powers and using potions that cause supernatural things to happen or mythical creatures to respond to their beckoning. In either case, the witch or sorcerer is the one that has the power to make these thing happen. Given the popularity of sorcery in popular media and literature, it is important to understand what does the Bible definition for sorcery? Sorcery (n.) c. 1300, “witchcraft, magic, enchantment; act or instance of sorcery; supernatural state of affairs; seemingly magical works,” from Old French sorcerie, from sorcier, “sorcerer, wizard,” from Medieval Latin “sortiarius” teller of fortunes by lot; sorcerer,” literally “one who influences fate or fortune,” from Latin sors (genitive sortis) “lot, fate, fortune” (see sort (n.)). It is clear from these references that sorcery is deeply involved in practices that are satanic and has a drug use element to it that causes alterations in a person’s ability to think clearly. This is of particular importance because if someone is involved in using mind-altering drugs, they cannot have the mind of Christ. Without the mind of Christ, we do not have protection over our thoughts and that allows us to be deceived, accepting of antichrist teaching, and inspires us to make Christ honoring decisions. Simply stated, sorcery is a key element to leading people away from God and results in destroying their lives. (See also Romans 15:6; 1 Corinthians 1:10; 1 Corinthians 2:16; Philippians 1:27; Philippians 2:5; Philippians 4:7-9; 2 Thessalonians 2:2; 1 Peter 1:13; 1 Peter 4:1). Sorcery is referred to several times in the Bible. In its base form it is found in Hebrew and Greek words that are translated as sorcery, witchcraft, whispering a spell, enchanting, practicing magic, or drug use. All references to sorcery have a satanic, antichrist focus that destroys their lives by leading people away from Christ and living their lives for Him. 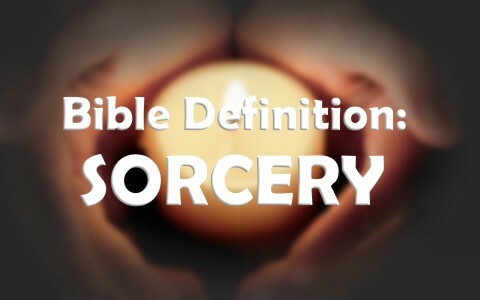 Read more on this subject here: What Does the Bible Say About Sorcery? Very informative n exactly the answers or knowledge shared I was looking for. Thank you. Are modern day magicians committing a sin by doing magic shows? Please send me a reply by email. I cannot answer that for the person performing the magic tricks. If they think it is wrong after having studied these passages then to them it is sin, for what is not of faith is sin. Personally, I would want nothing to do with magic and speaking for myself, I think it is wrong, so to each one, they must be convinced it is wrong or it is right in their own mind. Does this make sense sir? Some of you need to get over yourselves. What kind of God do you think you have? A mean old man who sits upstairs and decides to let you burn in hell forever for watching a kid’s show called Harry Potter? I’ve been a Christian for a long time, and I’ve learned a thing or two from paying attention to other Christians. There is a type of Christian in this world who is very concerned with the devil and hell and especially how most people are going to hell. I believe that type of Christian has entirely misunderstood who Jesus was and why He died. I believe Christianity is foremostly about LOVE. I believe Jesus, and as He is a true reflection of the Father, is about LOVE. Not hell. Not mistakes and sins. Love. The Pharisees were also very literal-minded about the rules, and what was a sin and what wasn’t a sin, and who was evil and who wasn’t. Jesus called them “a nest of vipers”. God asks you for faith. He asks you for your love. Not your fear. Not that you should obey every rule. Jesus did not much appreciate the judgemental or the spiritually-proud. So I would say, not have you watched Harry Potter, but do you pay too much attention to what other people are doing and judging it? I don’t want to be the kind of Christian that Jesus just wouldn’t like; a mean, judgemental, superior sort of person-even if I obeyed ALL the rules. You are right that Jesus came and demonstrated the greatest love the world will ever know. You are wrong that Jesus, “did not much appreciate the judgmental”. Assuming we both accept the Bible as a reliable source of God’s will and wisdom, it states that all people are going to face judgment and Jesus himself will be the presiding judge. Jesus does clearly represent forgiveness and understanding of our fallen state. It is equally clear he does not endorse willful disobedience. To blur the impact on our relationship with God through the acceptance of demonic power as manifested through witchcraft is not just spiritual blindness, it is opening a door for compromise in many areas which are inconsistent with loving God with all our heart, mind, soul and strength.